MyChoiceFX is a MetaTrader-only broker regulated in Belize. It offers several dozen forex pairs and CFDs, but its narrow range of research tools and lack of a regulatory license from a major jurisdiction weighs down on its offering. Please Note: FX Choice (MyChoiceFX) was not included in the 2019 annual review. As a result, this broker's ratings may be outdated. Read our Best Forex Brokers 2019 guide for a look at the top rated forex and CFDs brokers. Founded in 2010, FX Choice Limited (MyChoiceFX) is a MetaTrader-only broker regulated by the International Financial Services Commission (IFSC) of Belize. It offers the popular MetaTrader 4 (MT4) and MetaTrader 5 (MT5) platforms developed by MetaQuotes Software Corporation. MyChoiceFX offers 50 instruments, which include 38 forex pairs, and CFDs on seven indices, two energy contracts, two metals, and on bitcoin. Here at ForexBrokers.com, we maintain the largest independent regulatory database available on the web. Using 28 different variables, we have created a proprietary 1-100 score (the higher the better) of overall trustworthiness, which we call the Trust Score. Here is our trust summary of MyChoiceFX. The following table summarizes the different investment products available to MyChoiceFX clients. MyChoiceFX offers the Classic and Pro account types where the commissions and fees vary across each one. 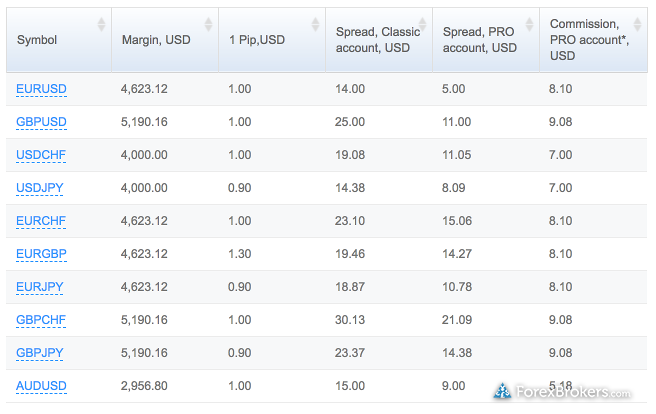 In the Classic account, the broker lists a spread of $14 on the EUR/USD pair, or 1.4 pips, meanwhile, the Pro account is commission-based with an $8.08 commission or 0.8 pips added to spreads of 0.7 pips, bringing the all-in cost to a level similar to that of the Classic account. It is worth noting that the spreads in the following excerpt from the broker’s site are minimum spreads and not average or typical spreads. MyChoiceFX also offers an active trader account for Pro account holders who become automatically enrolled, and with the first of four tiers kicking in when deposits exceed $10,000, or trailing 30-day volume exceeds $250K and commissions are slightly reduced. The default tier equates to roughly $35 per side or $70 per standard round turn. MyChoiceFX offers several options when it comes to research beyond an economic calendar and a virtual private server (VPS) service for MT4 and MT5 users, as well as Myfxbook Autotrade for social copy trading. The broker has a range of educational-related content, which falls more towards the support side of its offering than its research side. Research remains an area in which MyChoiceFX has considerable room to expand, as its current offering is very limited. MyChoiceFX is a MetaTrader-only broker, whose offerings come from the suite of platforms developed by MetaQuotes Software Corporation, including the MetaTrader 4 (MT4) platform. To learn more about MT4, read our MetaTrader guide. 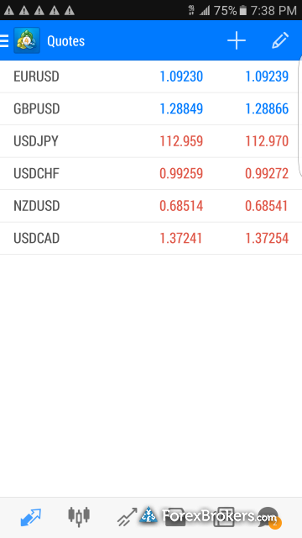 MyChoiceFX offers iOS and Android mobile trading applications for its MetaTrader platforms, available directly from developers on the iTunes Store and Google Play. To learn more about MT4, read our guide to MetaTrader. For traders looking for a MetaTrader-only broker that offers both MT4 and MT5, MyChoiceFX has a limited range of tradeable markets, with just 50 available instruments and few research-related tools. In addition, the broker lacks regulatory status in a major jurisdiction, although it is ahead of other brokers who lack jurisdiction altogether, as MyChoiceFX is regulated in Belize. Having said that, obtaining another license in a major financial hub would greatly boost the broker’s trust score, and add more research content such as daily market analysis. Select one or more of these brokers to compare against FX Choice (MyChoiceFX). Find out how FX Choice (MyChoiceFX) stacks up against other brokers.